Fancy desserts don’t have to be difficult. And they definitely don’t have to tear up your gut. This decadent dessert is simple, but does take quite a bit of baking time so start early if serving for a dinner party. Since it’s served cool, you can make ahead. 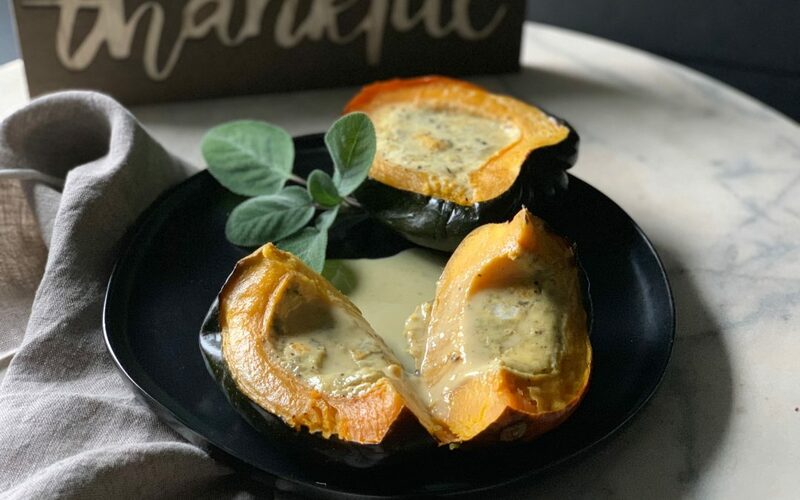 Acorn squash is a great source of vitamin C (think immune boost), vitamin A (think healthy skin), potassium (may help regulated blood pressure) and fiber (supports digestive health). Coconut milk is an excellent non-dairy alternative for custard, and contains healthy fats. Egg yolks are an excellent source of MANY nutrients, especially B-vitamins. Cook and cool the acorn squash ahead of time. Can make the entire recipe in advance since it’s served cool. 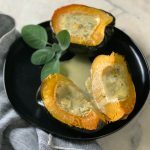 For a simpler, Elimination Diet-Friendly version, skip the custard and roast squash with cinnamon and coconut oil. YUM! Use heavy cream in place of coconut cream if you can tolerate dairy. Use another sweetener of choice live stevia, agave or manuka honey. 1 Tbsp olive oil extra virgin, buy in glass container - not plastic! Cut a small piece off the bottom of the acorn squash halves so that they sit flat on the baking sheet. Drizzle with olive oil, sprinkle with salt and sage and cook for 40 minutes. Remove squash and let cool completely. Whisk together coconut milk, cream, egg yolks, sugar, orange zest, salt and pepper. Pour mixture into cooled squash halves and bake at 300 degrees F for about 50 minutes until mixture jiggles like a gelatin. Let cool for a couple hours until custard sets up. Cut squash halves in half to create 4 servings. Top with nuts when serving. Acorn squash is a great source of vitamins C & A, potassium and fiber. For a simpler *Elimination Diet-friendly* version, simply roast squash with cinnamon and coconut oil and enjoy warm. If you tolerate dairy, you can replace the coconut cream with heavy cream. This is a decadent dessert that can be made ahead of time as it is served cool.